Spoon carving knives or hook knives are great for carving wooden spoons, bowls and Kuksa cups. This guy does a good job of giving you the basics to keep your blade sharp. Advance video to about 3 minutes in for the sharpening instructions. A continuous radius blade allows you to carve bowls, kuksas and even the bowl of a spoon, leaving a smooth finish for minimal sanding. This carving knife can be used for spoon carving, whittling, marking, and general woodworking and handicrafts. A tool that originated in Sweden and used as part of an education system called Slojd. Our Sloyd knives are made of high carbon D2 steel. An all leather sheath for your sloyd knife. 5-6 oz. thick leather with a triple welt for protection. All three size Sloyd knives fit in this sheath. Great for any project where you need to scoop out a surface like spoons or bowls. 3 knife blank sizes available. 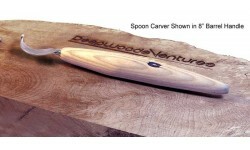 A spoon carving knife is the tool to have when carving spoons or bowls. 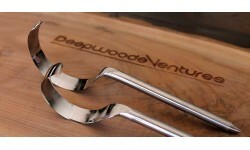 Available in 3 sizes with a 5" or 8" barrel style handle. Choose Right or Left handed blade. Used for carving spoons or bowls. Great tool when you need to scoop out a surface. 3 sizes and 2 handle options available, or just the blade. Choose Right or Left handed hook knife blade. A symmetrical blade made of a continuous radius. Used to create bowls, Kuksa cups, shallow spoons, etc. Efficiently removes wood and leaves a nice smooth finish. Available in 2 sizes - 2 1/2"(65mm) or 2" (50mm), Right or Left Hand. These are available in a unhandled blade only.